After studying art in Italy, Tanavoli returned to Tehran in 1960. 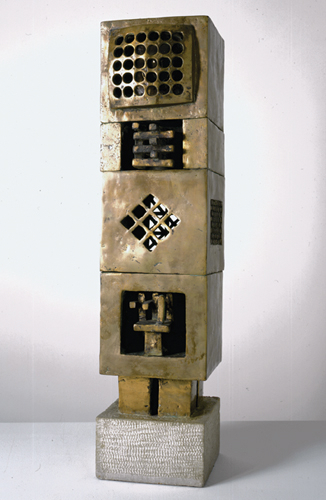 He soon became Zenderoudi’s accomplice in the Saqqakhaneh venture, developing a distinct form of bronze sculpture that combines modernist impulses with Iranian forms. Building his works incrementally, he employs an artistic vocabulary forged from contemporary tools and artisanal objects: welded faucets, tubes, and grillwork, and the keys and locks he collected in local bazaars. As Fereshteh Daftari writes, “We Are Happy Locked Within Holes evoke[s] a cage or prison tower and invites the viewer … to form a hybrid language that converts a prison into a temple of love.”1 Here Tanavoli encourages the observer to look beyond the surface into confined spaces where sexuality and love clandestinely survive—in the form of a phallus in one cell and interlaced hands in another. 1. Fereshteh Daftari, “Another Modernism: An Iranian Perspective,” in Picturing Iran: Art, Society and Revolution, ed. Lynn Gumpert and Shiva Balaghi (London: I.B. Tauris, 2002), 77. Dimensions 30 x 7 1/4 x 10 3/4 in.